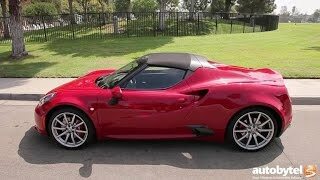 Words kept on floating as to what all the new Alfa Romeo 4C Spider 2015 holds in it or it’s just an open roof version to its Coupe model. Keen car lovers like us, all gathered at the 2014 Geneva Motor Show trying to find out fields upgraded. After a thorough look and study here is what came out from our side. As we talked earlier about the model being one like coupe, we found a few changes in the interior of Alfa Romeo 4C Spider 2015. Differences got into eyes with the new leather upholstery getting accompanied by the carbon fiber tub, which is more visible in this model in comparison to Coupe. Another new add-on is the Alpine-premium sound system with hands free Bluetooth phone connection and audio streaming. Apart as far as interior of 4C spider is concerned we found rest similar like the flat bottomed steering wheel, driver oriented center stack and TFT screen instrument cluster. For more features company is providing its buyers an option to go for Track Package. Talking first about the new upgrades in the exterior of Alfa Romeo 4C Spider 2015 would be little easy as there are very few changes like those amalgamated in headlights, wheel options, titanium exhaust system, rear decklid and roof design. The roof definitely comes with an option to remove while the exhaust system comes with carbon tips. The carbon fiber manufactured windshield brace are also an addition. Apart from these the rest in the exterior goes just like the predecessor, let that than be the grille or the rear spoiler. With its 1.75 liter turbocharged engine the Alfa Romeo 4C Spider produces 240 hp and 350 nm torque mated to Alfa’s TCT automatic transmission. The model thus reaches the top speed of 160 mph with its 0-60 mph sprint to be in just 4.1 seconds. There are a few upgrades in the performance section as well, like the one made in the dual-exhaust and the computer software also. The latest software allows the driver to switch from Dynamic to natural to all weather. Each of them giving the best for what they are built and tagged as. 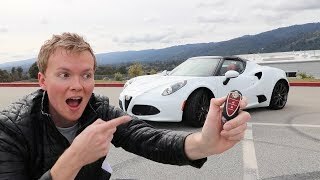 Till date of article there wasn’t any update to the price of Alfa Romeo 4C Spider 2015 but expectation are of it being somewhere around $60,000. Talking about those waiting for model in the battle field we would name Porsche Boxster GTS and Mercedes Benz SLK350.